Max, while there’s not an explicit document that covers it, I think there’s been a fair amount of work done — by folks like Neel, Emily, Mo, Brand, Shreyas, Paul Tevis, Nathan Paoletta, myself, and others — that, when put together, combines to form a communities of practice approach to roleplaying theory that I think is steadily gaining some ground. That is, instead of categorizing player or group behaviors, we’re looking more at the processes by which individual groups create a common repertoire of play behaviors, often through a process of negotiated misunderstanding. Neel nailed this early on with talking about a “shared symbolic language” and we’ve been building on that ever since, bit by bit. Honestly, from my perspective, looking at “how processes form” instead of “what some common processes are” seems much more likely to yield interesting and useful results over the long term. One interesting trait of this approach to theory is that, while it’s focused on how groups create their own idiosyncratic behavioral norms, I think many people active in this kind of thinking are disinterested in creating an idiosyncratic way of talking about roleplaying, even if that might ease intercommunication between various writers. As such, there’s relatively little shared terminology and no general effort to make everything fit together. Everybody is basically doing their own thing, but with a shared set of concerns. That’s partially a structural thing that comes from these discussions largely taking place on individual blogs, but it’s also part of a larger philosophy about how to approach theory in general, I suspect. All the signs I see still point to folks moving away from broad, formal models towards more relativistic understandings of smaller bits of roleplaying. I think I would gesture in the direction of blogs like 20×20 Room and Sin Aesthetics and increasing contact with the Nordic roleplaying scene for pushing us down this path by emphasizing just how differently many play groups approach roleplaying, ways not easily described and categorized by formal approaches. While the larger roleplaying scene in the US frequently deals with these new approaches by labeling them “not roleplaying,” the indie roleplaying community has embraced them and, as a consequence, had to deal with how they’ve challenged existing understandings of what we do and the context in which roleplaying occurs. So, naturally, our thinking has changed. The “Context Does Matter Too” movement is just getting going in a largely “System Does (Only) Matter” environment, at least in the US indie scene. I think we may see a push forward in the complexity of theory if some of these projects like the International Journal of Roleplaying finally get off the ground, which will inject some folks with strong theoretical backgrounds into this conversation. But, right now, roleplaying theory is still largely concerned with the practical matter of improving play and mechanical design, less with improving small group communication and organization, much less with understanding how roleplaying works on a theoretical level. Most people doing theory, myself included, don’t have the chops for stuff on the level of systems theory or even organizational studies or conversational narrative. Maybe we will someday, but I’m not expecting that to happen soon. 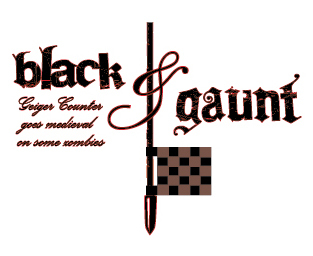 Played Black & Gaunt last week at SGBoston. It was pretty fun for all involved, but the system didn’t quite support us as much as I’d like. I really wanted to evoke that zombie movie effect where the main characters are herded into an increasingly smaller space by a growing army of the dead, and that just doesn’t happen with the rules currently. Talking with Eric and April over falafel afterwards, one of them suggested that it would make a lot more sense if the zombies could actually occupy an increasing amount of territory on the board. So you’d have an increasing number of zombie tokens that would grow and mark out locations that the zombies had taken over. Characters in those locations would be guaranteed to be attacked, but characters could avoid the zombies by sticking to unoccupied locations (where they would presumably still be fighting amongst themselves). Another thing I wanted was for the major locations in the game to be further subdivided into smaller locations to do the “room by room” affect that happens with zombies and even in the Aliens movies. So, on the new map that I just worked up, the major locations also have blown-up outlines for you to draw individual rooms on and add basements and subbasements. Once it matters, then, where particular individuals are within a specific location, you subdivide that location on a zoomed in map. This may be something worth porting back to Geiger Counter in general. Local recluse Nathan Paoletta has weighed in on one of the major issues current occupying indie roleplaying’s awkward adolescence: dealing with how mechanics actually get implemented in play, instead of narrowly looking at how they might work in an abstract, ideal case. Folks have brought this up before, but this seems to be a popular topic recently. Nathan’s comments remind me of what Paul Tevis was saying over on Cultures of Play, that he was slowly coming to realize that there’s a number of things that we like about roleplaying that can’t (or maybe just shouldn’t) be the focus of mechanics. This relates to earlier conversations about the “fruitful void” a bit, but is also the sign of something new. It’ll be interesting to watch how different people choose to react to this growing concern, both in play and in publishing. I was just talking to my brother on the phone. He just became co-editor of Top Shelf Comics’ new webcomics imprint, meaning he can leave his other half-time job and work in comics full-time. It’s interesting, now that one of the Walton boys has achieved “the dream” of making a living working in a creative field, I’m left reflecting on how “the dream” seems less and less applicable to roleplaying. When I was a teenager, I dreamed of making a career in roleplaying or comics. Putting aside comics, making a career in roleplaying now seems ridiculous to me. I’m not sure why I would want to do that. It would be a lot of work for meager return, whether it was through freelancing for major companies or trying to make it as a full-time independent publisher. And I think I would like game design and publishing much less if I was depending on it to make ends meet. Webcomics (and up-and-coming creative types in print comics) are dominated by college students and twenty somethings, most of whom hope to make a career out of comics. They’re willing to eat Kraft dinner for months just to make it through art school and possibly get a shot at being the next Craig Thompson. Indie roleplaying, in contrast, is dominated by late-20s-to-middle-aged cats who already have a career. Maybe some kids too. They’re not going to abandon financial security to try to make a living from independent game publishing. Even folks like Brennan Taylor, the owner of Indie Press Revolution, has smartly chosen to not try to turn his indie games distributing business into a career. Of course, there are some folks who haven’t given up “the dream” and are, in fact, living it. Luke Crane, Jared Sorensen, and Thor Olavsrud come to mind (though I’m not sure if Thor hopes to someday turn his editorial gig with the game-producing wing of Archaia Studios Press into a full-time thing). However, I think, in the main, indie roleplaying is dominated by folks who don’t necessarily need to view game publishing as a means of generating income, because they have a “real” job that provides fairly well. And where does this lead… to the de-professionalization of roleplaying game design and publishing, where people treat their game design work (correctly, I would argue) as a hobby and not a career. This has all sorts of ramifications. Making money is secondary. Sales numbers stop being the main measure of “success.” Maybe creative works are shared freely instead of sold, because that extra bit of income isn’t as important. There’s no need to beg for mainstream media coverage. There’s no reason to evangelically expand roleplaying to the masses. There’s no reason to care about the decline of the industry. But, as things are moving now, indie roleplaying has, in effect, given up on “the dream” of game publishing as a full-time career. We don’t want it. I like my job, personally, and I wouldn’t give it up to develop games, unless a major company was going to hire me to edit a boutique imprint. Even then, it would be a hard choice. What’s the health plan like? (Honestly, they don’t want me anyway; they want Evil Hat, who are more invested in doing crossover work with indie style but mainstream appeal.) More importantly, I’m not working towards the dream and I’m not seeking it out. I’m getting on with my life but staying committed to working on and publishing games on the side, because, you know, why not? It’s fun. And so it everyone else I know. Interesting. There’s a PDF version here. There are five named characters, John of Gaunt (pale knight), the Black Prince (dark king), Isabella the She-Wolf (dark queen), Abbe Allegre (dark bishop), and the Seigneur (dark rook). There are also eight dark pawns which are placed on the board to represent English soldiers, French peasants, ladies in waiting, and the like. At the start of the game, John of Gaunt has wondered off, encountered strange forces, and become undead. Over the course of the game he builds an undead army from those he (and his undead followers) have killed. The characters that are still alive try to stop the undead by destroying them or eliminating the source of their power. Failing that, they might try simply to escape back to England. While there is a starting map for the game, suggesting the outline of the manorial lands formerly governed by the Seigneur before the English invasion, the players should feel free to draw whatever other features they like on the map, including bridges, hidden basements, lost Roman ruins, etc. Generally speaking the game play like Geiger Counter but with the following changes. 1. John of Gaunt and other undead characters always roll as many dice as there are undead. This means up to 12, since there are 13 characters total. John of Gaunt starts out rolling one die, for just himself. 2. Pawns do not have survival dice and only roll one die in conflicts. Other characters start with one survival die and one advantage die. 3. Undead are created when characters lose rolls in conflicts and die fighting other undead. 4. Noble non-pawn characters, when losing a conflict, can choose — instead of dying and becoming undead — to declare that some other character in the same scene dies instead. If this is a pawn, then they’re dead. If this is another noble, they can pass the buck again, to someone else. When the buck is passed, the passing character must take a condition instead. 5. Acceptable conditions for this hack include: Alone, Hysterical, Injured, Lost, Pursued, Trapped, Unprepared (all but Dead and Infected). I’m not sure what the maximum number of conditions should be. Maybe 5? 6. Once either all the pawns or one of the non-pawn characters has become undead, the living characters can finally discover one or more methods of killing the undead. Good luck with that. 7. I’m not sure how many advantage dice should be on the map. I might try to run it in a GM’d style, playing John of Gaunt and just passing out advantage dice in new locations as it feels right. Then I’ll count them up and aim for that many when running it the next time. Another option might be to generate one advantage die in a resource pool for every pawn killed, which the players can then draw on whenever they like. I’ll report later on how it goes. Pretty excited about this. Check out the secret chamber below the manor house and the chess pieces on the sides for marking off who’s alive, who’s undead, and who’s just dead. I really hope I can get it finished tomorrow in time for SGBoston. Johnathan Walton: You write games with Asian themes. I challenge you to write a game about life under the 14th century manor system in France or England. Your choice! 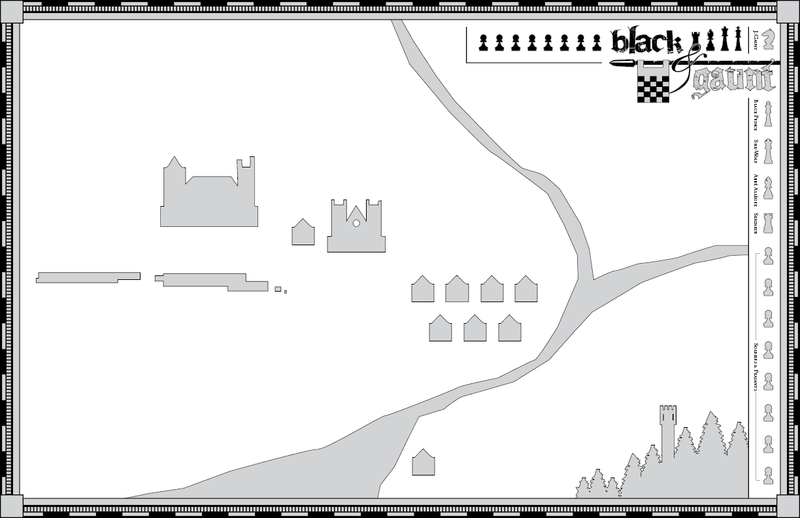 Black & Gaunt: In the midst of the Hundred Years’ War, Edward of Woodstock (the Black Prince of Wales) and John of Gaunt arrive with their armies on the shores of France, seizing the manorial lands of the local French lords. Within a month, there is a virulent outbreak among the peasantry, what seems at first to be the remnants of the Black Death which just recently filled so many graves. However, it soon becomes clear that something else is afoot, perhaps dark magicks cast by the Antipope of Avignon, because the peasants, themselves rather blackened & gaunt, are rising up, hungry for the flesh of Englishmen. A pre-drawn map, with the manor house (several floors, celler), peasant lands, the old well (with Roman tunnels beneath), the church (with catacombs and graveyard), the ships of the invading English just off-shore, etc. Players will still draw in new features on the map, but there will be a bunch of things there ready to be played with. Some advantage dice will be pre-assigned to things. A set of fixed characters, complete with stats, which the players choose from. They go by catchy one-word names: Black (the Black Prince), Gaunt (John of), Issy (Queen Consort Isabella, the She-Wolf of France), the peasant maid Joan (of Arc), a few other named soldiers, sailors, peasants, priests, etc. 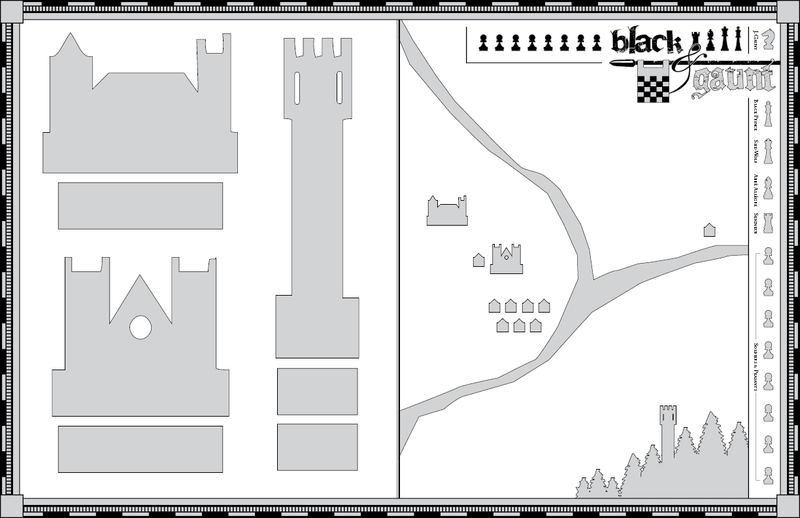 Each players’ character is represented on the map by a black chess piece (up to 5, King, Queen, Knight, Rook, Bishop). NPCs are represented by white chess pieces. The menace is represented by black pawns. When the menace increases its number of Menace Dice, it also increases from one pawn to multiple pawns, representing the growing zombie horde. It maxes out at 8 pawns, the full contingent in a chess set. I know I gave up forums, but there’s a relative new one called Cultures of Play that Ryan Macklin started. Like the Forge, Story Games, and Knife Fight, it seems really exciting in the beginning, and hopefully it will continue to be so for a while. I think I will try to restrain myself from posting too much, because that’s one of the proven ways to ruin a forum. This is cross-posted from there, though. Ryan’s been talking about this “Middle Ground” term that he and Leonard Balsera have been discussing. This is me unpacking what that term means to me, because I’m probably coming from somewhere else. “Middle Ground” is a loaded term for me because of the work of cultural historian Richard White, who uses it in a very specific way in his award-winning 1991 book, The Middle Ground: Indians, Empires, and Republics in the Great Lakes Region, 1650-1815. This book was really significant in changing the way I thought about interpersonal and intercultural communication, though Richard White himself warns that many aspects of the Middle Ground he described are unique to the period he was talking about and may not be accurate when applied universally to other situations. White’s book is about Native American and European interactions during a specific period of French colonialism in the Great Lakes region. His central argument is that — because neither side had the power to dictate the rules of how the relationship between them could be conducted — they created their own system of interaction through a process of trial and error, a pidgin in-between culture founded on misunderstanding the intentions of the other. For example, the French would do one thing, hoping for a certain kind of reaction from the native peoples, and the native peoples would do something else, maybe in response, maybe totally unrelated, and, over time, this formed a set of rituals, rituals that weren’t things native people or French people would ever normally do, but rituals that only had meaning when certain French and Native American people performed them together. Otherwise, they were meaningless. These rituals were both an artifact of intercultural communication and a method of communicating between the cultures. So, basically, before they could communicate, both sides had to collectively create a system for communicating, basically through misinterpreting what the other side was doing. 1. Focusing on how Western cultures transmit traditions to non-Western cultures. 2. Focusing on how non-Western cultures misinterpret and adapt Western traditions. 3. Focusing on how, in the process of transmitting culture, Western cultures also transmit their false understandings of non-Western cultures (Said’s Orientalism being the classic example of this kind of model). Standaert’s fourth model is something like Richard White’s “middle ground.” He says that this last model focuses on how different cultures come together to create something new as a result of their interactions, something neither of them could have created on their own. Speaking more generally, not about White or Standaert’s specific thoughts, I think this way of thinking about intercultural communication has many direct ties to what happens in roleplaying, the communication between players that creates something new, often through a process of misunderstanding. It’s also interesting that White’s model specifically posits that this only happens when one side cannot dictate the rules for interaction or overwhelm the other. It only happens when there is a negotiation that occurs because of relative parity. There’s more than a few lessons there, I think, speaking to some of what’s underlying the “player empowerment” that’s often mentioned in relation to small press games. I don’t know if anyone’s noticed, but many of the things I’ve been thinking about for Blacktop Slip make it a glorified Agon-hack, probably because I’ve been playing a fair bit of Agon at SGBoston lately. I’m definitely thinking about the positioning rules and the range strip when I imagine cars struggling to outmaneuver each other during a race or chase scene. I’m also thinking about the evocative way Agon ties the hands of the players to the hands of their characters, having attack dice rolled in your sword hand and defense dice rolled in your shield hand. Clearly this works well for car chases too. – You can drive with both hands, maximizing your control. – You can drive with one hand and shift gears with the other. – You can drive with one hand and shoot a gun with the other. – You can take both hands off the wheel and shift while shooting. – You can take both hands off the wheel and shoot with both hands. Likewise, you also have one foot (assuming you’re the driver). – You can maintain speed. – You can slow down slightly. – You can slow down a lot. – You can increase speed slightly. – You can increase speed a lot. Ideally, there’d be optimum speeds to keep your car at while in certain gears, similar to the optimum range for weapons in Agon. If optimum for Third Gear is 25-50 mph, if you’re going 70 (or 15) in Third Gear, you’ll definitely be facing penalties to driving or possibly even suffer damage to your car. I was also thinking that gear may determine how many cards a vehicle moves forward in a single turn (since, as the last post described, tracks are measured in playing cards), but that movement happens at the end of a turn, after all the things happening in a turn have been determined. This way, when all cars are moved, players can describe what happens to them, including them rolling over and exploding, or how they pulled an amazing drift around a sharp turn, etc. I was playing with my Hot Wheels cars a bit this morning and I noticed that playing cards, when laid horizontally, are the perfect width to represent a 2-lane highway relative to the size of the cars. Bingo, now we have a way of creating tracks, laying down cards beside each other and angling them to create curves and overpasses and whatnot. And cards also provide a way to measure positioning. A car can either be on the same card as another car (racing side by side) or a number of cards ahead or behind it. Dammit, now I actually have to go see Speed Racer.